This research focused on four specific regions in New Zealand which are affected by digital exclusion: Bay of Plenty (Kawerau), the West Coast (Westport), South Auckland (Mangere and Manurewa) and Naenae in the Hutt Valley. Parents and caregivers of school-aged children. The research targeted both people who experience digital exclusion themselves and people who care for and work with people and communities who experience digital exclusion (e.g. teachers, librarians, people running digital inclusion projects, community and youth workers). We held discussion groups and interviews in Naenae, Wellington Central, Mangere, Manurewa, Westport and Kawerau. In each of these areas we spoke with young people, parents of school age children, and with social and community workers. In total we heard from 62 people. In each area we recruited different groups of people. For example, in Naenae we focused on Māori youth. In Manurewa we heard from women with experience of family violence. In Mangere we heard from Pasifika youth. In Westport we heard from young people on the Independent Youth Benefit, and in Kawerau we heard from teen parents. In Wellington we heard from a group of visually impaired youth. We also held one-on-one interviews with youth with disabilities and former refugee youth. teachers and students at Kawerau Wananga o Aotearoa. women with experience of family violence in Auckland. Recruitment was done in different ways in different contexts, but generally we relied on trusted local actors to invite participants who were in the target groups. For example, to recruit young people living independently in the Westport area, we worked with a youth worker who supported independent youth. She invited young people to join the discussion. To recruit women with experience of family violence we worked with a community group who supports women, and the coordinator of the group invited women to our discussion. Participants in discussion groups were given a $25 voucher as a thank you and in recognition of the time they had given to this research. Interviewees were generally interviewed in the course of their work, and were generally not given vouchers. This qualitative research was conducted by discussion groups with people who are more likely to experience digital exclusion, and a mix of individual and group interviews with people who work with them. The discussion tools used in the groups included questions for participants to answer individually on sticky notes, group discussion of the ideas put forward by individuals, probing questions to explore those ideas, dot votes and spectrums. Both the dot-voting and the spectrums were designed specifically as a way to generate discussion and were not designed or used to gather any sort of quantitative data. Alongside group discussions, in-depth interviews were conducted with youth and social workers. All discussions and interviews were recorded and transcribed. The transcriptions were read by both the lead and assistant researcher, separately, each of whom used a mixture of deductive (using codes derived from existing literature) and inductive coding - also known as grounded analysis - to tag the data. Through this process a matrix of codes and themes emerged from the data. This matrix helped show how data tagged under one code was connected to data tagged under another code, and to explore those connections. The lead researcher then returned to the transcriptions to corroborate this interpretation of the data by looking for disconfirming evidence and negative cases. With the limited scope of this research we were not able to explore in detail the experiences of each specific and distinct group of people affected by digital exclusion, but we did aim to recruit diverse groups for the discussions, including ethnic and gender diversity, and people who have experience of disability (including learning disabilities and mental illness). The scope of this research did not allow a detailed exploration of the experiences of seniors or people who are or have been in detention. We heard mainly from young people, with 67% of our participants being under twenty-five. 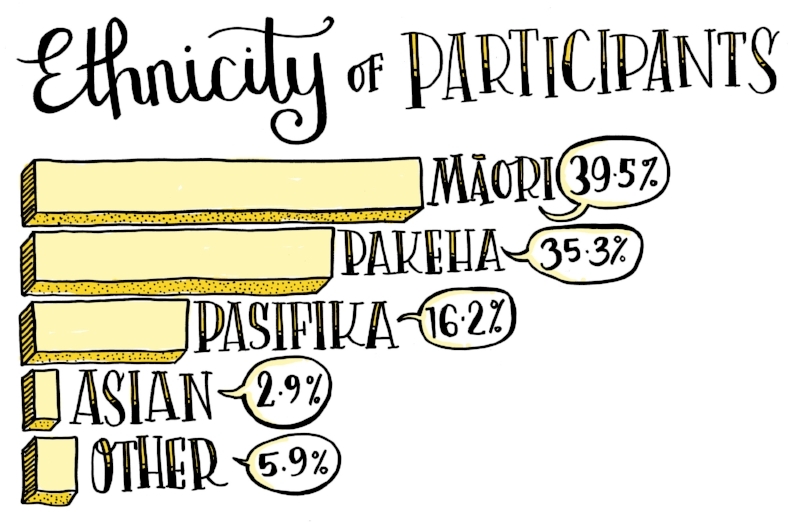 Almost 40% of our participants identified as Māori, 35% as Pakeha and 16% as Pasifika. 27 identified as Māori, 24 as Pākehā or European New Zealander, 11 as Pasifika, 2 identified as Asian and 4 gave other ethnic identities. Some participants gave multiple ethnic identities. 25 identified as men, 35 as women and 2 as non-binary. 19 were under 18 years of age, another 23 were aged 18-24 years, and then remaining 20 participants were over 25 years of age. Thirteen participants with disabilities were specifically recruited for discussion groups and interviews. We didn’t ask participants in the general discussion groups whether they identified as having a disability, including mental illness however some of these participants did describe their experiences of disability and mental illness as part of the discussions about barriers to digital inclusion. We talked to 23 people living in provincial or rural areas of New Zealand (Westport and Kawerau), and 35 people living in urban areas (Naenae, Mangere and Manurewa). 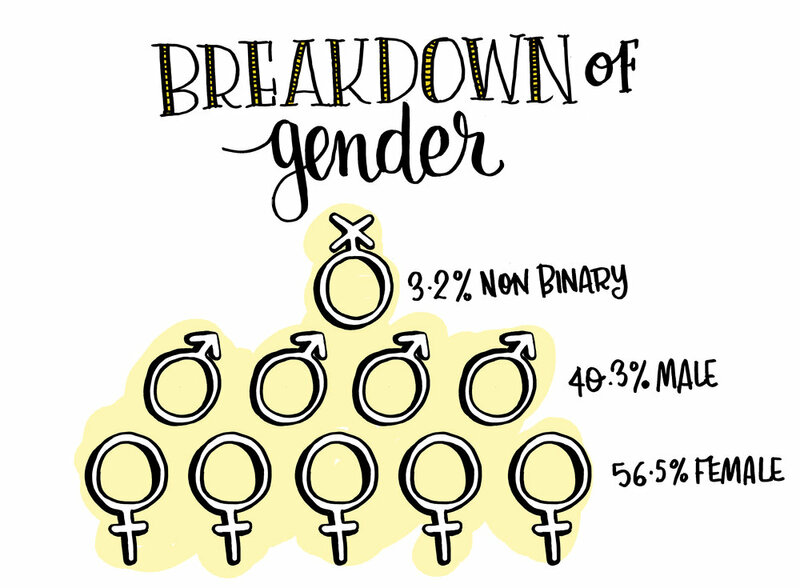 Looking at our demographic information, we heard from more girls and women than we did from boys and men. Although we had a good representation of Māori young people and parents, we would have liked to have heard from more Pasifika New Zealanders. In addition, we spoke to two young people who identified as transgender or non-binary but did not speak to a focus group of LGBTQI+ young people. Amongst the young people living with disabilities we interviewed most were quite highly educated. Our group of youth with disabilities did not include any Pasifika young people, or any people living remotely. We also did not hear from any youth with learning disabilities, though we spoke to the parents of a child with learning disabilities, and some participants in our focus groups identified learning challenges as having been a barrier to their digital inclusion.